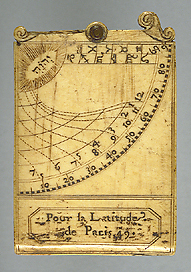 One side of this ivory vertical dial has a Regiomontanus-type dial, with latitudes numbered from 5 to 60 by five. The zodiacal signs are engraved on the top part of the dial, and common hour are numbered from 1 to 12 in two opposite directions. On the right hand side of the Regiomontanus dial is a scale of latitudes with the symbols of the zodiacal signs. The arm for the plumb bob is missing. On three rims of the ivory plate is a shadow scale, divided to ten and to five, subdivided to one by alternate shading. The left-hand side of the scale is numbered from 20 to 100 by 20. The shorter side of the leaf is numbered twice; one division is from 100, 80, 60, 44 (recte 40? ), 02 (recte 20?) and below, another division is 10 to 40 by ten. The right-hand side of the scale is numbered from 50 to 90 by ten. The other side of the leaf has an horary quadrant: the limb of the quadrant has a scale of degrees, divided to ten and to five, subdivided to one by alternate shading, numbered from 10 to 90 by ten. The plumb bob is missing. Common hour lines are numbered from 5 to 12 to 7. In the apex is the Hebrew tetragram meaning 'God'. On the top part of the leaf is a scale with the symbols of the zodiacal signs. On the bottom part of the leaf is the inscription 'Pour la Latitude de Paris 49'. The two terminal scrolls at the top of the leaf are pierced to form sights (one of them is broken). The instrument was purchased in 1895 and is described in F. A. B. Ward, A Catalogue of European Scientific Instruments in the Department of Medieval and Later Antiquities of the British Museum (London, 1981), p. 57, no.152.